Racing Kayaks are a class of boat that are used primarily for flat water sprint and marathon, however the same boats are also used for descent racing (racing down rivers with varying degrees of big weirs and waves, particularly popular in South Africa). 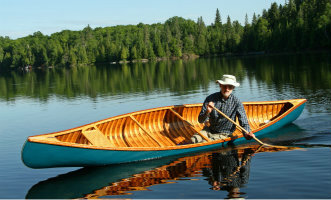 Single boats are referred to as K1s. Doubles as K2’s and four man boats as K4’s. These are the common set ups although we recently saw our first K3. It made us look twice and caused some discussion! Because a boats speed is related to its length and width the length of these boats is set by international regulations that most countries adopt. Minimum weights are also set. K1’s are 5.2m in length (or shorter) and more than 12kg sprint, 8kg marathon, K2s are 6.5m in length (or shorter) and more than 18kg sprint, 12kg marathon whilst K4’s are 11m (or shorter)and 30kg or more sprint. In practice all competitive boats are these lengths, there is no minimum width and boats vary considerably in weight according to the construction. Weights may be added provided they are securely fixed to ensure that the minimum weight is achieved. Whilst all of these boats have the same basic dimensions there are some variations in design and construction according to their use. All racing kayaks have rudders to steer. 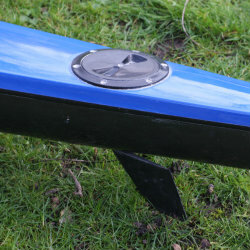 The rudder is controlled with the feet and connected from the rudder location near the back of the boat to the footrest via a rudder wheel and wires. Sprint Racing Kayaks do not need to have any regard to manoeuvrability or performance on more than lake or regatta course chop. (Having said that many regatta courses can be quite rough when the wind picks up!). It is important that they track in a straight line really well with no tendency to wander. As such they will have the least rocker and will be on the faster, sleeker and consequently more unstable end of the range of boats. There is a limit however between speed and stability. It is no good producing a very fast boat that is so unstable that the athlete is unable to put the necessary power into their stroke. 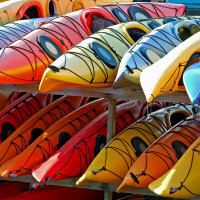 The trade off between these factors is one that is a key part of racing kayak design. Rudders on these boats do not have to take into account the possibility of being hit on rocks so can be any depth, although with some courses the likelihood of picking up weed on the rudder needs to be considered. Sprint boats use under-stern rudders which are located about 18 inches from the stern accessed through a rudder hatch set into the top of the boat. These boats will run the fastest if the hull is as streamlined as possible, not flexing or deforming from the intended design. As a result a very stiff construction is sought with carbon often being incorporated into the construction to lend the boats a strong, stiff finish at just under the minimum weight. Additional weights are then added to get to just the right weight. 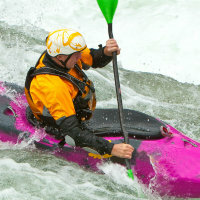 Download our Lists of Racing kayaks here. Includes all known sizes, with stability rating etc. Marathon kayaks need to sit well on washes, cruise at high speeds, turn well and pick up speed for sprints as needed. Essentially they are very little different from sprint kayaks and many models are used for both styles of racing. Variations occur where more stability and manoeuvrability is required for descent racing. 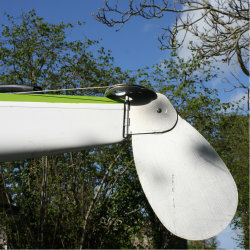 Where races take place down weirs or over shallows where the rudder might hit the bottom over-stern rudders are used. These rudders are mounted on the stern and kick up on a hinge when they hit an obstacle so that no damage is done. Higher volume models with a little more rocker and more stability will be chosen for descent racing where plenty of time can be lost through a swim caused by lack of manoeuvrability or stability and some extra volume will reduce the chances of being swamped cutting through waves. The weight limit for marathon racing boats is lower (8kg K1 and 12kg K2) and with the necessity to run carrying the boat on portages light weight boats are in much demand. Light weight strong boats are not cheap to build and the lightest boats are generally made using a vacuum forming process with a combination of kevlar and carbon in the materials for strength, stiffness and lightness. A small element of flex can be beneficial if the boats are to be used on rocky courses where the very stiff boat might chip or break. There are lots of aspects to setting up a racing kayak correctly to get the perfect trim, seating position and accessories: footrest type and position, seat type, height, position, angle, padding, pullbar, footpump, rudder wire tension etc. Read all about Sprint racing in the UK. How to enter and what to expect. Racing paddles to make you paddle fast! There are a few dominant manufacturers. Nelo based in Portugal are probably the best known and most prolific makers at the moment. They have a strong presence in both sprint and marathon on every World Class line up. Of the current manufacturers Vajda and Plastex probably have the next most longstanding pedigree as racing boat designers and manufacturers. Nelo have a name for leading design, they have a huge modern factory and boats come in a full range of sizes, Cinco's replace the previous Quattros and Vanquish I, II and III. From personal experience we think the M sizes are similar or smaller than the Accelero/ Vajda S sizes which is good news for smaller paddlers when you are comparing boats. UK dealer Ultimate Kayaks. A few years ago Vajda and Nelo were the two big names,Nelo seem to have forged ahead but Vajda have some excellent designs. We love their smallest K2 the Ultrasonic M, the Accelero S and the Supersonic M all boats we own and paddle. UK dealer Marsport. Latest designs have a new Trapezoidal hull shape. UK dealer Olly Harding. Can be bought off the shelf as they only come in one colour...White with a red seam. The fittings are generally some of the easiest for quick adjustment. UK dealer Ultimate Kayaks. A newer manufacturer although they have been around a while now. Also suppliers of paddling machines. UK dealer Steve Tingay. Good range of boats of differing stability. Marsport also import Vajda's into the UK. Etas and Zetas fast but stable proving very popular. Gamma K2 is a nice mid sized boat although the low volume version is tight on even skinny hips! Kirton have a name for very good quality construction. We all still love a quality Kirton made Regina for fast forgiving K2 paddling when the water is a bit swirly even though tis decades old. Popular boats partially due to price. We can recommend the Freelancer as a fairly stable but fast K1. UK importer Simon Dark. Wide range of descent boats, UK importer Race Pace Ltd.
We can't claim any knowledge of this manufacturer apart from that they appeared with a lot of boats at at least one regatta in the UK in 2014. If you know more please let us know. Nelo have a name for leading design, they have a huge modern factory and boats come in a full range of sizes, Cincos replace the previous Quattros and Vanquish I, II and III. From personal experience we think the M sizes are similar or smaller than the Accelero/ Vajda S sizes which is good news for smaller paddlers when you are comparing boats.UK dealer Ultimate Kayaks. A few years ago Vajda and Nelo were the two big names,Nelo seem to have forged ahead but Vajda have some excellent designs. We love their smallest K2 the Ultrasonic M, the Accelero S and the Supersonic M all boats we own and paddle.UK dealer Marsport. Popular boats partially due to price. We can recommend the Freelancer as a fairly stable but fast K1. UK dealer Simon Dark. Similar market to Zedtech in terms of price. 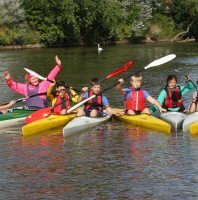 UK dealer Elio Kayaks. Wide range of descent boats. UK dealer Race Pace Ltd.